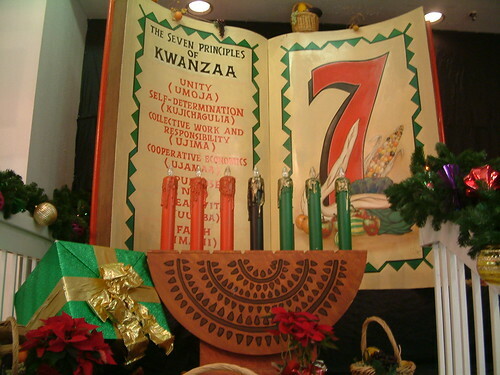 FREE 5 day Kwanzaa Celebration at The Wright Museum starts Friday.. The Charles H. Wright Museum of African American History will celebrate five days of the African American holiday of Kwanzaa. Beginning Friday, December 26th, celebrations will continue over the next six days (excluding Monday, December 29), culminating on December 31. All Kwanzaa events will be held at the museum, located at 315 East Warren Avenue in Midtown Detroit’s Cultural Center and are family-friendly, and FREE and open to the public. Local organizations including the Shrine of the Black Madonna, the Nsoroma Institute, and the Malcolm X Grassroots association, have partnered with the museum to bring a collection of cultural offerings together for the series. Each day, attendees can expect a unique celebration and opportunity for enlightenment. Over the week, the Kwanzaa series will include candle-lighting ceremonies, performances, film screenings, marketplace shopping, and a fashion show hosted by hip hop artist and community activist Khary Frazier. All Kwanzaa events are family-friendly, and free and open to the public. · Friday, December 26 – 6 PM: Umoja (Unity) in partnership with Shrine of the Black Madonna and featuring a Kwanzaa marketplace. · Saturday, December 27 – 1 PM: Kujichagulia (Self-Determination) in partnership with the Malcolm X Grassroots Association. · Sunday, December 28 – 6 PM: Ujima (Collective Work and Responsibility) in partnership with Nsoroma Institute and featuring a Kwanzaa marketplace. · Tuesday, December 30 – 6 PM: Nia (Purpose) Liberation Film Series encore presentation of Raz Babbaa Aaron Pori Pitts: Portraits of a Revolutionary. · Wednesday, December 31 – 5 PM: Kuumba (Creativity) in partnership with Khary Frazier and featuring a cultural fashion show and Taste of Ethiopia samples. Founded in 1965 and located at 315 East Warren Avenue in Midtown Detroit’s Cultural Center, The Wright Museum is the world’s largest institution dedicated to the African American experience. For more information please visit TheWright.org.